File this under the “better late than never” category. 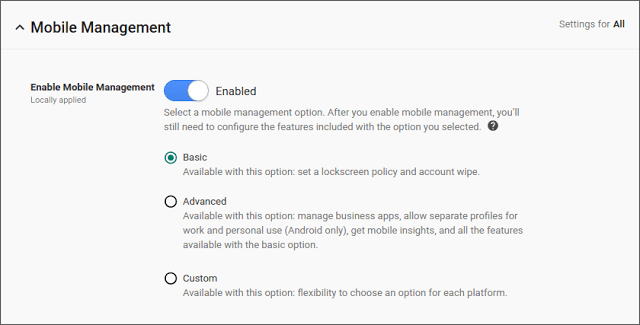 Over a year after releasing the ability to manage iOS devices, even those without a Mobile Device Management (MDM) profile, Google has added the same functionality for Android devices in G Suite. The feature means that admins can set basic security requirements on Android devices without requiring the BOYD owner to install a MDM profile on their phone. It is unclear why it took Google so long to add this functionality for Android devices but likely has to do with the shear number of devices that are out on the market with various configurations. For owners of the BOYD Android device in question, they have peace of mind in that their personal data will not be wiped should the G Suite corporate account be wiped. The new feature is rolling out to domains now and it will take up to 15 days before it reaches all domains. Once it does reach your domain, admins will need to enable the feature. To do so, admins simply need to select “Basic” under Device management > Setup > Mobile Management > Enable Mobile Management in the Admin console.